Bilbao BBK Live brings together present, past and future in their latest line-up announcement, which features many of the biggest artists from the national and international scene. Taking place from 11 – 13 July 2019, acts including The Strokes, Suede, Brockhampton, Rosalía, Idles, Thom Yorke, Princess Nokia and Nils Frahm are amongst the new acts unveiled today for the forward-thinking Spanish festival. Joining the already announced Weezer to kick off their global comeback in Bilbao is The Strokes, the New York City band credited with resurrecting rock in the early noughties, breathing new life into the genre and leaving their mark on countless groups to date. Catalan artist Rosalía also stars. The flamenco artist is one of the most relevant artist to emerge from the Spanish scene in many years, revolutionising the scene and picking up a Latin Grammy Award in the process. Thom Yorke brings his ‘Tomorrow’s Modern Boxes’ tour to Bilbao. The Radiohead frontman will be joined by Nigel Godrich and video artist Tarik Barri to perform songs from a variety of his solo albums. Britpop pioneers Suede, now back with their eighth album The Blue Hour, are also set to bring their electrifying live show to the Kobetamendi Mountain in the heart of the Basque Country. Other acts announced today include American rapper Vince Staples; musical collective Brockhampton; barrier-breaking Harlem rapper Princess Nokia; experimental Argentinian artist Nathy Peluso; Ms Nina, one of the prime exponents of Spanish reggaeton and trap; and Mueveloreina who fuse trap with tropical sounds and powerful lyrics. Bilbao BBK Live 2019 also presents Idles, undoubtedly one of the bands of the year who, with their latest record, have broken onto the international scene and firmly established themselves as the official successors of authentic British punk. Joining the revered Bristolians are fellow Brits Sleaford Mods, Slaves and Shame, along with Stockholm’s punk collective Viagra Boys. Alongside all of this, Kobetamendi holds much more in store, from the return of John Grant, who since the breakup of The Czars has remained one of the best voices in American indie music, to The Voidz, the side-project of one Julian Casablancas, as well as prime proponents of international pop and indie-rock Cut Copy, Khruangbin and Jonathan Bree. Fans of electronic music can also look forward to performances from Nils Frahm, whose soundscapes have once more topped every best-of-2018 list, Hot Chip, Modeselektor Live, Nicola Cruz, Omar Souleyman, The Blaze, Yaeji and Kero Kero Bonito. Rounding off the hefty roster of national and local artists are Vetusta Morla, Pony Bravo, Calavento, Uniforms, Serrulla, Olatz Salvador, EraBatera and Belatz. All of these and many more acts will be performing live at the festival on 11, 12 and 13 July 2019 atop the stunning Kobetamendi Mountain, elevating the musical experience with a unique and unparalleled concert space. 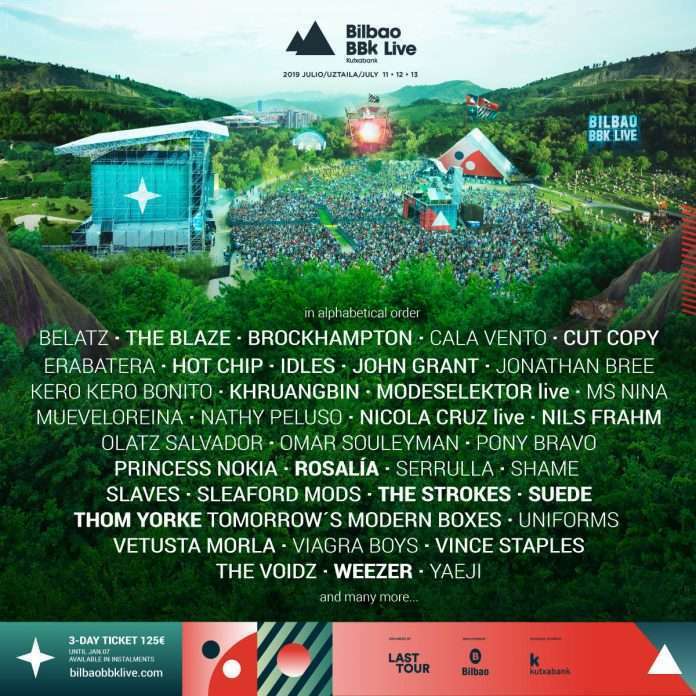 Bilbao BBK Live promises, yet another year, to be the place to be for an unmissable celebration of the best music of the moment. 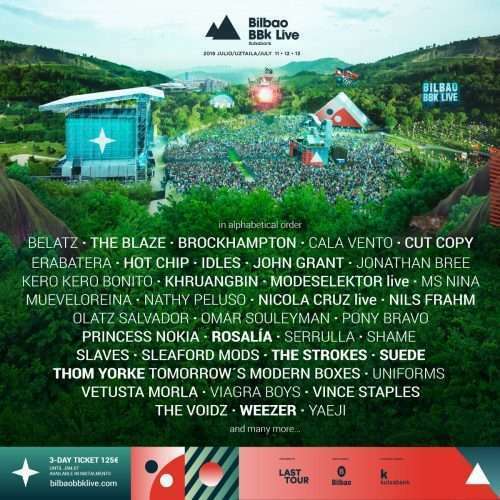 Book your 3-day festival pass now for just €125 at bilbaobbklive.com. Offer valid to 7 January .